In nephrogenic systemic fibrosis (NSF), an over-reaction to some biological trigger in patients with acute or severe chronic renal insufficiency leads to extensive fibrosis involving skin, subcutaneous tissues and, sometimes, internal organs. Its association with gadolinium-based contrast agents (GBCAs), especially at high doses,  has led to the hypothesis that GBCAs can be part of the trigger. Dialysis,  edema,  hyperphosphatemia,  epoetin  and pro-inflammatory conditions  are additional important risk factors. Black Box FDA warnings, European EMEA and other regulatory actions have led to renal function screening for MRI patients and using less or no GBCA when the glomerular filtration rate (GFR) is estimated to be less than 30 mL/min. Dialysis patients are scheduled to have gadolinium-enhanced MRI scans just before a routine dialysis appointment to help remove the GBCA as quickly as possible. Since the establishment of these warnings and regulatory actions, NSF has nearly completely disappeared. Within the last 3 years, almost no new cases with symptom onset have been reported. NSF presents with dermal pain, thickening and hardening, especially in the lower extremities. The extent ranges from small patches of skin to extensive areas of the body but universally sparing the face. The thickened, peau d'orange skin may acquire a "cobblestone" texture, dimpling or a woody aspect, which are often accompanied by mild-to-moderate edema. Sharp pains, burning or itching may occur in affected areas. These lesions often encompass joints. Joint contractures (n= 115) or limited range of motion (n= 23) were present in 138 of the 227 patients for whom these data were available. Five additional patients reportedly had "stiffness" without contractures. This suggests that over one third of the patients had a mild form of NSF without contractures or limited range of motion. Scleral plaque or injection was described in 20 cases; otherwise no facial involvement was reported. Some of the imaging features included soft tissue activity on bone scanning (n= 8), skin thickening on mammography (n= 4), dermal calcification (n= 9) or inflammatory changes on CT scans (n= 14). Internal organ involvement was described in 16 cases. Among the 386 patients whose gender was reported , males (n= 202) and females (n= 184) appeared to be equally affected. Mean age was 51 years (8 to 87 years - see [Figure 1]). There were no cases reported in neonates or toddlers even though neonates with low GFR (due to immature kidneys) commonly receive high doses of GBCA, especially for imaging congenital heart disease. This indicates that very young patients are somehow protected. One possible reason is that the immune system at this age is not sufficiently developed to overreact to the NSF trigger. 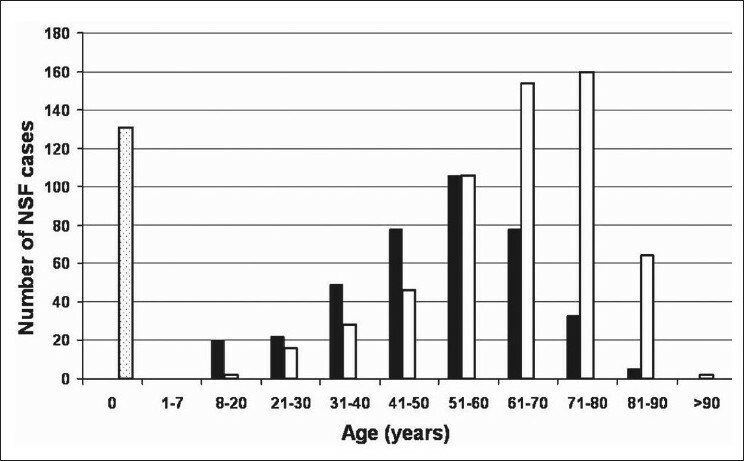 Figure 1: Effect of age on NSF incidence: For 391 patients reported in the literature whose age is available, the number of NSF patients in each decade of age is shown in solid black bars. Open bars show age distribution for patients undergoing high-dose MR examinations with GFR <30 mL/min at Columbia College of Physicians and Surgeons over 10 years. Note that peak NSF incidence occurs in the 51-60 years age group. No NSF cases are reported in patients less than 8 years old or greater than 87 years old. Open bar with black dots shows the number of infants less than 1 year old receiving high-dose GBCA at Columbia. The absence of NSF cases in infants in spite of their immature kidneys and a large number receiving high dose indicates infants are not at risk of developing NSF. A reduced incidence for age >70 years even though there are many more at-risk patients (GFR <30 mL/min) receiving high doses of GBCA suggests that elderly patients are also protected. NSF incidence peaks in the decade corresponding to age 51 to 60 years and decreases at older ages even though elderly patients have more severe renal disease and more per capita GBCA-enhanced MRIs. This may reflect a less active immune system and decreased ability to mount an inflammatory response in the elderly. Indeed the oldest reported patient with NSF was only 87 years old in spite of there being many >90-year-olds with low GFR receiving high doses of GBCA. Thus infants and patients greater than 90 years of age appear to have zero risk of developing NSF. In 77 of the 100 papers, history of GBCA administration was investigated. Data and clarifications were also provided by the authors of 49 papers via e-mail; accordingly, data on the relationship between GBCA and NSF was available for 313 patients for this review update. A total of 280 (89%) patients were noted to have had GBCA injections prior to NSF symptom onset. The existence of NSF in patients without prior gadolinium exposure is one reason why the relationship of GBCA with NSF remains just an association and GBCA is not considered to be the proven cause of NSF. The time interval between GBCA injection and onset of NSF was available in 225 patients, ranging from the onset being on the same day to 3 years. When intervals between GBCA exposure and symptom onset that were greater than 1 year were excluded (i.e., no relationship for 14 cases with an interval >1 year), the mean interval between GBCA exposure and symptom onset was 62 days. 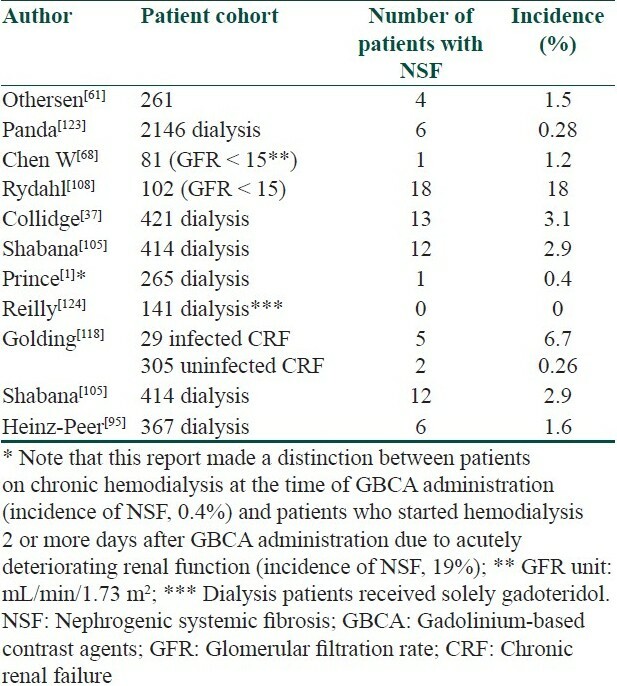 Data on incidence of NSF in patients with renal failure who were exposed to GBCA is shown in [Table 1]. The wide range of incidence, from 0% to 18%, suggests that many variables affect NSF risk. Renal dysfunction was reported for all NSF patients. Highest NSF risk was described for GFR <15 mL/min, i.e., chronic kidney disease (CKD) stage 5. In 385 patients, it was possible to determine whether or not the patient was on dialysis around the time of developing NSF, including hemodialysis (n= 205), peritoneal dialysis (n= 37), both (n= 13), continuous veno- venous hemofiltration (CVVH) (n= 4) or unspecified (n= 67). Thus 85% (326/385) of NSF patients were on dialysis, indicating that dialysis is a major risk factor. For 59 NSF patients presumably not on dialysis, GFR was reported to range from 0 (anuric) to 54 mL/min with a mean value of 16 mL/min. For 3 patients in whom estimated GFR was greater than 30 mL/min, there was acute renal failure, indicating that the true GFR was actually lower. One patient with an estimated GFR greater than 30 mL/min had got done the GFR measurement 1 month prior to GBCA injection. Another chronic renal failure patient with an estimated GFR of 54 mL/min (stage 3 CKD) at the time of GBCA injection developed NSF more than 2 years after that injection, suggesting that the NSF trigger in that patient may have been a different kind of, as yet undiscovered, exposure. In 224 patients for whom the description in the literature allowed discrimination between acute and chronic renal failure, 61 (27%) had acute renal failure or acute deterioration of chronic renal failure. Acute renal failure has also been reported as an NSF risk factor with odds ratio of 13.4. However, in these 61 patients with acutely deteriorating renal function at the time of GBCA administration, only 19 (31%) patients out of those for whom data on mobility was available had contractions. Follow-up data, available for 37 of the NSF patients, related to acute renal failure shows that 2 (5%) had a complete resolution of NSF and 17 (46%) showed improvement. This likely reflects the tendency of NSF to improve with restoration of renal function that may occur when acute renal failure resolves. Thus although acute renal failure increases NSF risk, the ensuing NSF clinical course may not be as debilitating. Although 326 patients were on dialysis at the time of developing NSF, a number of factors may have reduced the effectiveness of dialysis for those patients who developed NSF. In a disproportionately large number of NSF cases, peritoneal dialysis (n= 37) or CVVH (n= 4) was utilized, both of which are known to be less effective at rapidly removing GBCA compared to hemodialysis. , In 54 patients, it was specifically reported that GBCA-enhanced abdominal magnetic resonance angiography (MRA) was performed, which can assess for renal artery stenosis as the cause of the renal failure prior to initiating dialysis. When initiating dialysis, the first sessions are of lower intensity, to help the patient acclimate to the stress of hemodialysis. In addition, for patients awaiting initiation of dialysis, the interval between GBCA exposure for MRA and first dialysis may be longer than the usual 2 days between sessions for chronic dialysis patients. In 7 patients, GBCA-enhanced MRA was used to evaluate dialysis fistulae. Effective dialysis following their GBCA-enhanced MRA was less likely if the dialysis fistula was malfunctioning. For 66 patients in whom the interval between GBCA administration and dialysis could be determined, dialysis was performed the same day in 16 patients, a day later in 13 patients, 2 days later in 9 patients and ≥3 days later in 28 patients. Thus most NSF patients on dialysis may have had a delay between administration of GBCA and receiving of dialysis; may have had peritoneal dialysis (PD) or CVVH, both of which are less effective at removing GBCA; or may have had lower-quality dialysis due to reduced fistula function or just beginning dialysis. For 7 of the patients dialyzed within 2 days of GBCA exposure, the authors specifically indicated that it was a low-intensity dialysis, which could not be expected to remove as much gadolinium as standard hemodialysis. , These data support using prompt hemodialysis to reduce NSF risk in dialysis. In 36 (46%) of the 79 NSF patients with history of renal allograft, the renal transplant was failing. In most of these 36 cases, renal transplant artery MRA with high-dose GBCA was being performed to determine if there was a correctable renal transplant artery stenosis. Several articles had listed wrong GBCA doses; these were corrected by corresponding with authors. In 280 cases with data on GBCA dose, 35 (12.5%) patients appeared to have received a standard dose of GBCA (0.1 mMol/kg) in the MRI exam most immediately preceding development of NSF, and 245 (87.5%) patients received high-dose GBCA. The mean total dose was estimated to be 48 mL. Data from individual case series showing the increased NSF risk with higher GBCA doses is listed in [Table 2]. NSF risk is reduced by at least an order of magnitude by limiting the dose to 0.1 mMol/kg. However, 0.1 mMol/kg becomes "high dose" when a second injection is necessary due to nondiagnostic results with a poorly timed or extravasated first injection. Thus dose reduction also requires having the best technologists and nurses performing the examinations using the best possible equipment for at-risk patients to minimize the need for repeat injections. MRA exams in the past used high dose to make up for equipment limitations; with state-of-the-art equipment, MRA is diagnostic with standard, 0.1 mMol/kg, dose or sometimes less. FDA approval of gadofosveset trisodium, a high-relaxivity blood pool contrast agent, also allows diagnostic MRA with very low doses even with older equipment. Only 63 papers indicated type of GBCA, which included 263 patients who were most likely exposed. Many articles indicated a failure to maintain accurate patient records of GBCA administration, hence the GBCA type had to be inferred from purchase-related or formulary records. There were also errors in reporting GBCA type, with an erratum in at least one paper  and several corrections on GBCA type made after correspondence with author. Another issue was the uncertainty about patient exposures at outside institutions. Where information on type of GBCA was provided, gadodiamide (n= 210), gadopentetate dimeglumine (n= 30), gadoversetamide (n= 5), gadobutrol (n= 3) and multiple agents, including gadobenate and gadoteridol (n= 15), were described; although the accuracy and completeness of this data were questionable. The large proportion of cases with nonionic agents (gadodiamide and gadoversetamide) [Table 3], which have lower in vitro stability compared to the ionic (gadopentetate dimeglumine, gadoxetate, gadofosveset and gadobenate) and macrocyclic (gadoteridol, gadobutrol) agents, has led to the hypothesis that lower chelate stability may contribute to greater NSF risk. However, this does not necessarily reflect overall risk for individual patients because nonionic contrast agents have fewer serious allergic-type adverse events ,, and fewer deaths (see FDA AERS database). 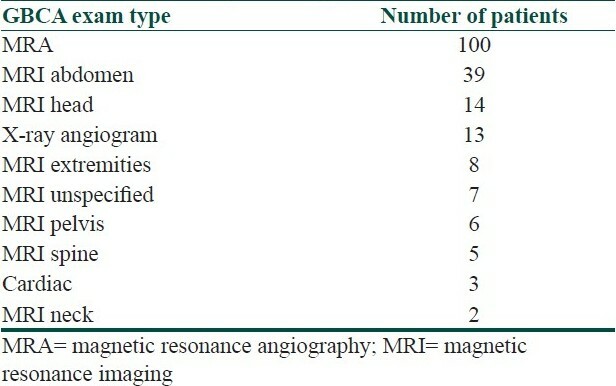 MRI exam type for 195 patients was reported to be MRA in 100 (51%) patients. This reflects the common use of high doses for MRA exams [Table 4]. Abdominal MRI (n= 34; 17%), including liver and magnetic resonance cholangiopancreatography (MRCP), was the second most common MR exam type, which also likely reflects high doses for liver MRI prior to 2008. Erythropoetin (epoetin) is commonly given to renal-failure patients to stimulate the bone marrow to produce more red corpuscles. As epoetin is known to be pro-inflammatory and to stimulate other cell lines in the bone marrow, the possibility that it represents a factor contributing to risk has been suggested by several authors. , In 82 patients for whom medication details were provided, 66 (80%) were on epoetin, including many on high doses. Extra-positively charged protons at lower pH (acidosis) may compete with gadolinium-binding sites on the chelator, weakening the strength of the gadolinium-chelate bond. , Of the 43 patients with data on either blood gas or bicarbonate results near the time of GBCA administration, 23 (53%) were noted to be acidotic. Elevated serum phosphorus is common in renal failure. For 86 patients whose serum phosphorus data was available, it was found that serum phosphorus level was elevated to a mean of 6.8 mg/dL (2.3 mmol/L) (normal, 2.5 to 4.5 mg/dL, 0.8 to 1.5 mmol/L). Hyperphosphatemia increases the risk of phosphate binding and precipitation of Gd +++ when it is transiently released from the chelator, thereby preventing re-association. Although no authors had data on zinc, this cation is known to compete with gadolinium for chelator-binding sites, an action which promotes release of free gadolinium ions, i.e., transmetallation. Of the 248 patients for whom follow-up data was available, 55 experienced NSF symptom improvement, and cure was noted in 5 cases. Partial (n= 8) or complete (n= 3) improvement occurred following restoration of renal function in 11 cases. One NSF patient was reported to have substantial improvement after renal transplant but then deteriorated after allograft rejection. Clinical course was stable in 63 patients. Death was noted in 71 patients but was attributed to NSF in only 3 cases. Cardiopulmonary disease (n= 20), infections (n= 7), general anesthesia (n= 1), SLE (n= 1), lymphoma (n= 1), renal cell carcinoma (n= 1), myeloma (n= 1), toxic megacolon (n= 1), mesenteric ischemia (n= 1), severe stroke (n= 1), multi-organ involvement (n= 2), sudden death (n= 1) and 'unknown' (n= 30) were the other causes of death reported. In 25 patients, the symptoms were progressive. In another 30 patients, the authors only mentioned "alive" without further details. As 81% of NSF patients were on dialysis, this is the most important risk factor for identifying at-risk patients. Renal transplant is another important risk factor. For all inpatients, existing serum creatinine data should be checked to identify patients with GFR <30 mL/min. Although NSF is very rare in outpatients who are not on dialysis, serum creatinine should also be checked in outpatients when severe renal impairment is discovered in the MR patient-safety questionnaire. Acute renal failure is readily detected by asking patients if they are able to urinate. Most institutions appear to have had no NSF cases. Changes in GBCA use since the association between NSF and GBCA was reported in 2006 have nearly eliminated new cases, as reported to the FDA, European Medicines Agency (EMEA) and manufacturers. Thus it appears that attention to NSF risk factors can allow safe administration of GBCA in most patients, including patients with chronic renal insufficiency or on dialysis. These data compiled from 408 cases reported in the literature suggest that reductions in risk as high as an order of magnitude can be attained with each of the following: 1) avoiding high dose (>0.1 mmol/kg); 2) avoiding nonionic linear chelates in dialysis patients and those with GFR <30 mL/min, especially in the setting of pro-inflammatory conditions; 3) dialyzing quickly after GBCA administration for patients already on dialysis; 4) avoiding GBCA in acute renal failure, especially while serum creatinine is rising. The youngest and oldest reported patients of NSF are 8 years and 87 years of age, respectively, which suggests that infants and very old, more than 87 years of age, individuals are a protected population that is not at risk. Understanding these risk factors can refine practice patterns to allow safe GBCA-enhanced MRI in most patients. I would like to thank Dr. Martin R. Prince for many helpful suggestions on this review. 1. Prince MR, Zhang H, Morris M, MacGregor JL, Grossman ME, Silberzweig J, et al. Incidence of nephrogenic systemic fibrosis at two large medical centers. Radiology 2008;248:807-16. 2. Cowper SE. Nephrogenic systemic fibrosis: A review and exploration of the role of gadolinium. Adv Dermatol 2007;23:131-54. 3. Prvulovic M. [Nephrogenic systemic fibrosis--new clinical entity]. Med Pregl 2008;61:439-41. 4. Frenzel T, Lengsfeld P, Schirmer H, Hutter J, Weinmann HJ. Stability of gadolinium-based magnetic resonance imaging contrast agents in human serum at 37 degrees C. Invest Radiol 2008;43:817-28. 5. Peak AS, Sheller A. Risk factors for developing gadolinium-induced nephrogenic systemic fibrosis. Ann Pharmacother 2007;41:1481-5. 6. Sadowski EA, Bennett LK, Chan MR, Wentland AL, Garrett AL, Garrett RW, et al. Nephrogenic systemic fibrosis: Risk factors and incidence estimation. Radiology 2007;243:148-57. 7. American College of Radiology. ACR Manual on Contrast Media (version 7, 2010). Available at: http://www.acr.org/SecondaryMainMenuCategories/quality_safety/contrast_manual/FullManual.aspx. 8. Leiner T, Kucharczyk W. NSF prevention in clinical practice: Summary of recommendations and guidelines in the United States, Canada, and Europe. J Magn Reson Imaging 2009;30:1357-63. 9. Prince MR, Zhang HL, Roditi GH, Leiner T, Kucharczyk W. Risk factors for NSF: A literature review. J Magn Reson Imaging 2009;30:1298-308. 10. Panesar M, Banerjee S, Barone GW. Clinical improvement of nephrogenic systemic fibrosis after kidney transplantation. Clin Transplant 2008;22:803-8. 11. Evenepoel P, Zeegers M, Segaert S, Claes K, Kuypers D, Maes B, et al. Nephrogenic fibrosing dermopathy: A novel, disabling disorder in patients with renal failure. Nephrol Dial Transplant 2004;19:469-73. 12. Obermoser G, Emberger M, Wieser M, Zelger B. Nephrogenic fibrosing dermopathy in two patients with systemic lupus erythematosus. Lupus 2004;13:609-12. 13. Streams BN, Liu V, Liegeois N, Moschella SM. Clinical and pathologic features of nephrogenic fibrosing dermopathy: A report of two cases. J Am Acad Dermatol 2003;48:42-7. 14. Swartz RD, Crofford LJ, Phan SH, Ike RW, Su LD. Nephrogenic fibrosing dermopathy: A novel cutaneous fibrosing disorder in patients with renal failure. Am J Med 2003;114:563-72. 15. Levine JM, Taylor RA, Elman LB, Bird SJ, Lavi E, Stolzenberg ED, et al. Involvement of skeletal muscle in dialysis-associated systemic fibrosis (nephrogenic fibrosing dermopathy). Muscle Nerve 2004;30:569-77. 16. Jiménez SA, Artlett CM, Sandorfi N, Derk C, Latinis K, Sawaya H, et al. Dialysis-associated systemic fibrosis (nephrogenic fibrosing dermopathy): Study of inflammatory cells and transforming growth factor beta1 expression in affected skin. Arthritis Rheum 2004;50:2660-6. 17. Daram SR, Cortese CM, Bastani B. Nephrogenic fibrosing dermopathy/nephrogenic systemic fibrosis: Report of a new case with literature review. Am J Kidney Dis 2005;46:754-9. 18. Ting WW, Stone MS, Madison KC, Kurtz K. Nephrogenic fibrosing dermopathy with systemic involvement. Arch Dermatol 2003;139:903-6. 19. Mendoza FA, Artlett CM, Sandorfi N, Latinis K, Piera-Velazquez S, Jimenez SA. Description of 12 cases of nephrogenic fibrosing dermopathy and review of the literature. Semin Arthritis Rheum 2006;35:238-49. 20. Kucher C, Steere J, Elenitsas R, Siegel DL, Xu X. Nephrogenic fibrosing dermopathy/nephrogenic systemic fibrosis with diaphragmatic involvement in a patient with respiratory failure. J Am Acad Dermatol 2006;54:S31-4. 21. Maloo M, Abt P, Kashyap R, Younan D, Zand M, Orloff M, et al. Nephrogenic systemic fibrosis among liver transplant recipients: A single institution experience and topic update. Am J Transplant 2006;6:2212-7. 22. Grobner T. Gadolinium-a specific trigger for the development of nephrogenic fibrosing dermopathy and nephrogenic systemic fibrosis? Nephrol Dial Transplant 2006;21:1104-8. 23. Auron A, Shao L, Warady BA. Nephrogenic fibrosing dermopathy in children. Pediatr Nephrol 2006;21:1307-11. 24. Kim RH, Ma L, Hayat SQ, Ahmed MM. Nephrogenic fibrosing dermopathy/nephrogenic systemic fibrosis in 2 patients with end-stage renal disease on hemodialysis. J Clin Rheumatol 2006;12:134-6. 25. Marckmann P, Skov L, Rossen K, Dupont A, Damholt MB, Heaf JG, et al. Nephrogenic systemic fibrosis: Suspected causative role of gadodiamide used for contrast-enhanced magnetic resonance imaging. J Am Soc Nephrol 2006;17:2359-62. 26. Abraham JL, Thakral C, Skov L, Rossen K, Marckmann P. Dermal inorganic gadolinium concentrations: Evidence for in vivo transmetallation and long-term persistence in nephrogenic systemic fibrosis. Br J Dermatol 2008;158:273-80. 27. Nowack R, Wachtler P. Scleroderma-like syndrome triggered by gadolinium. Nephrol Dial Transplant 2006;21:3344. 28. Introcaso CE, Hivnor C, Cowper S, Werth VP. Nephrogenic fibrosing dermopathy/nephrogenic systemic fibrosis: A case series of nine patients and review of the literature. Int J Dermatol 2007;46:447-52. 29. Solomon GJ, Wu E, Rosen PP. Nephrogenic systemic fibrosis mimicking inflammatory breast carcinoma. Arch Pathol Lab Med 2007;131:145-8. 30. Thakral C, Alhariri J, Abraham JL. Long-term retention of gadolinium in tissues from nephrogenic systemic fibrosis patient after multiple gadolinium-enhanced MRI scans: Case report and implications. Contrast Media Mol Imaging 2007;2:199-205. 31. Wahba IM, Simpson EL, White K. Gadolinium is not the only trigger for nephrogenic systemic fibrosis: Insights from two cases and review of the recent literature. Am J Transplant 2007;7:2425-32. 32. Moreno-Romero JA, Segura S, Mascaró JM Jr, Cowper SE, Julià M, Poch E, et al. Nephrogenic systemic fibrosis: A case series suggesting gadolinium as a possible aetiological factor. Br J Dermatol 2007;157:783-7. 33. Lim YL, Lee HY, Low SC, Chan LP, Goh NS, Pang SM. Possible role of gadolinium in nephrogenic systemic fibrosis: Report of two cases and review of the literature. Clin Exp Dermatol 2007;32:353-8. 34. Pryor JG, Scott GA. Nephrogenic systemic fibrosis: A clinicopathologic study of 6 cases. J Am Acad Dermatol 2007;57:902-3. 35. Khurana A, Runge VM, Narayanan M, Greene JF Jr, Nickel AE. Nephrogenic systemic fibrosis: A review of 6 cases temporally related to gadodiamide injection (omniscan). Invest Radiol 2007;42:139-45. 36. Boyd AS, Zic JA, Abraham JL. Gadolinium deposition in nephrogenic fibrosing dermopathy. J Am Acad Dermatol 2007;56:27-30. 37. Collidge TA, Thomson PC, Mark PB, Traynor JP, Jardine AG, Morris ST, et al. Gadolinium-enhanced MR imaging and nephrogenic systemic fibrosis: Retrospective study of a renal replacement therapy cohort. Radiology 2007;245:168-75. 38. Broome DR, Cottrell AC, Kanal E. Response to "Will dialysis prevent the development of nephrogenic systemic fibrosis after gadolinium-based contrast administration?" AJR Am J Roentgenol 2007;189:W234-5. 39. Lauenstein TC, Salman K, Morreira R, Tata S, Tudorascu D, Baramidze G, et al. Nephrogenic systemic fibrosis: Center case review. J Magn Reson Imaging 2007;26:1198-203. 40. Deo A, Fogel M, Cowper SE. Nephrogenic systemic fibrosis: A population study examining the relationship of disease development to gadolinium exposure. Clin J Am Soc Nephrol 2007;2:264-7. 41. Aires NB, Sotto MN, Nico MM. Nephrogenic fibrosing dermopathy: Report of two cases. Acta Derm Venereol 2007;87:521-4. 42. Weiss AS, Lucia MS, Teitelbaum I. A case of nephrogenic fibrosing dermopathy/nephrogenic systemic fibrosis. Nat Clin Pract Nephrol 2007;3:111-5. 43. Richmond H, Zwerner J, Kim Y, Fiorentino D. Nephrogenic systemic fibrosis: Relationship to gadolinium and response to photopheresis. Arch Dermatol 2007;143:1025-30. 44. Yerram P, Saab G, Karuparthi PR, Hayden MR, Khanna R. Nephrogenic systemic fibrosis: A mysterious disease in patients with renal failure--role of gadolinium-based contrast media in causation and the beneficial effect of intravenous sodium thiosulfate. Clin J Am Soc Nephrol 2007;2:258-63. 45. Todd DJ, Kagan A, Chibnik LB, Kay J. Cutaneous changes of nephrogenic systemic fibrosis: Predictor of early mortality and association with gadolinium exposure. Arthritis Rheum 2007;56:3433-41. 46. Cheung PP, Dorai Raj AK. Nephrogenic fibrosing dermopathy: A new clinical entity mimicking scleroderma. Intern Med J 2007;37:139-41. 47. Keyrouz S, Rudnicki SA. Neuromuscular involvement in nephrogenic systemic fibrosis. J Clin Neuromuscul Dis 2007;9:297-302. 48. Tsai CW, Chao CC, Wu VC, Hsiao CH, Chen YM. Nephrogenic fibrosing dermopathy in a peritoneal dialysis patient. Kidney Int 2007;72:1294. 49. Weenig RH, Gibson LE, el-Azhary R. The role of the hospital dermatologist in the diagnosis and treatment of calciphylaxis and nephrogenic systemic fibrosis. Semin Cutan Med Surg 2007;26:163-7. 50. Clorius S, Technau K, Watter T, Schwertfeger E, Fischer KG, Walz G, et al. Nephrogenic systemic fibrosis following exposure to gadolinium-containing contrast agent. Clin Nephrol 2007;68:249-52. 51. Caccetta T, Chan JJ. Nephrogenic systemic fibrosis associated with liver transplantation, renal failure and gadolinium. Australas J Dermatol 2008;49:48-51. 52. Anavekar NS, Chong AH, Norris R, Dowling J, Goodman D. Nephrogenic systemic fibrosis in a gadolinium-naive renal transplant recipient. Australas J Dermatol 2008;49:44-7. 53. Naylor E, Hu S, Robinson-Bostom L. Nephrogenic systemic fibrosis with septal panniculitis mimicking erythema nodosum. J Am Acad Dermatol 2008;58:149-50. 54. Kalb RE, Helm TN, Sperry H, Thakral C, Abraham JL, Kanal E. Gadolinium-induced nephrogenic systemic fibrosis in a patient with an acute and transient kidney injury. Br J Dermatol 2008;158:607-10. 55. Wiginton CD, Kelly B, Oto A, Jesse M, Aristimuno P, Ernst R, et al. Gadolinium-based contrast exposure, nephrogenic systemic fibrosis, and gadolinium detection in tissue. AJR Am J Roentgenol 2008;190:1060-8. 56. Saussereau E, Lacroix C, Cattaneo A, Mahieu L, Goulle JP. Hair and fingernail gadolinium ICP-MS contents in an overdose case associated with nephrogenic systemic fibrosis. Forensic Sci Int 2008;176:54-7. 57. Chao CC, Yang CC, Hsiao CH, Pan MK, Lin CH, Hsieh ST. Nephrogenic systemic fibrosis associated with gadolinium use. J Formos Med Assoc 2008;107:270-4. 58. Deng AC, Bilu Martin D, Sina B, Gaspari A. Localized nephrogenic fibrosing dermopathy: Aberrant dermal repairing? J Am Acad Dermatol 2008;58:336-9. 59. Jain SM, Wesson S, Hassanein A, Canova E, Hoy M, Fennell RS, et al. Nephrogenic fibrosing dermopathy in pediatric patients. Pediatr Nephrol 2004;19:467-70. 60. Wahba IM, White K, Meyer M, Simpson EL. The case for ultraviolet light therapy in nephrogenic fibrosing dermopathy--report of two cases and review of the literature. Nephrol Dial Transplant 2007;22:631-6. 61. Othersen JB, Maize JC, Woolson RF, Budisavljevic MN. Nephrogenic systemic fibrosis after exposure to gadolinium in patients with renal failure. Nephrol Dial Transplant 2007;22:3179-85. 62. Kallen AJ, Jhung MA, Cheng S, Hess T, Turabelidze G, Abramova L, et al. Gadolinium-containing magnetic resonance imaging contrast and nephrogenic systemic fibrosis: A case-control study. Am J Kidney Dis 2008;51:966-75. 63. Krous HF, Breisch E, Chadwick AE, Pinckney L, Malicki DM, Benador N. Nephrogenic systemic fibrosis with multiorgan involvement in a teenage male after lymphoma, Ewing's sarcoma, end-stage renal disease, and hemodialysis. Pediatr Dev Pathol 2007;10:395-402. 64. Nagai Y, Hasegawa M, Shinmi K, Kishi C, Tsushima Y, Endo K, et al. Nephrogenic systemic fibrosis with multiple calcification and osseous metaplasia. Acta Derm Venereol 2008;88:597-600. 65. Shin K, Granter SR, Coblyn JS, Gupta S. Progressive arm and leg stiffness in a patient with chronic renal impairment. Nat Clin Pract Rheumatol 2008;4:557-62. 66. Jan F, Mahboob H, Schwartz AB. Quiz page February 2008: A hemodialysis patient with thickened skin. Nephrogenic fibrosing dermopathy. Am J Kidney Dis 2008;51:A33-4. 67. Jan F, Segal JM, Dyer J, LeBoit P, Siegfried E, Frieden IJ. Nephrogenic fibrosing dermopathy: Two pediatric cases. J Pediatr 2003;143:678-81. 68. Chen W, Huang SL, Huang CS, Tsai MC, Lai HM, Lui CC, et al. Nephrogenic systemic fibrosis in advanced chronic kidney disease: A single hospital's experience in Taiwan. Eur J Dermatol 2009;19:44-9. 69. Bainotti S, Rota E, Bertrero M, Tamburrini O, Balducci A, Formica M. Nephrogenic systemic fibrosis: The first Italian gadolinium-proven case. Clin Nephrol 2008;70:514-7. 70. Chan KH, Tang WY, Hau KC, Lam WY, Lam H, Kwan TH, et al. Nephrogenic systemic fibrosis in a Chinese renal-transplant recipient. Clin Exp Dermatol 2009;34:244-6. 71. Pao VY, Chang S, Shoback DM, Bikle DD. Hypercalcemia and overexpression of CYP27B1 in a patient with nephrogenic systemic fibrosis: Clinical vignette and literature review. J Bone Miner Res 2009;24:1135-9. 72. Kreuter A, Gambichler T, Weiner SM, Schieren G. Limited effects of UV-A1 phototherapy in 3 patients with nephrogenic systemic fibrosis. Arch Dermatol 2008;144:1527-9. 73. Zelasko S, Hollingshead M, Castillo M, Bouldin TW. CT and MR imaging of progressive dural involvement by nephrogenic systemic fibrosis. AJNR Am J Neuroradiol 2008;29:1880-2. 74. Plamondon I, Samson C, Watters AK, Bégin LR, Côté J, Déziel C, et al. [Nephrogenic systemic fibrosis: More hard times for renal failure patients]. Nephrol Ther 2007;3:152-6. 75. Bremmer M, Deng A, Martin DB. Spontaneous eruptive keloid-like cutaneous lesions in a renal transplant patient: A form of nephrogenic systemic fibrosis? J Dermatolog Treat 2009;20:63-6. 76. Kadiyala D, Roer DA, Perazella MA. Nephrogenic systemic fibrosis associated with gadoversetamide exposure: Treatment with sodium thiosulfate. Am J Kidney Dis 2009;53:133-7. 77. Kintossou R, D'Incan M, Chauveau D, Bens G, Franck F, Dauplat MM, et al. [Nephrogenic fibrosing dermopathy treated with extracorporeal photopheresis: Role of gadolinium?] Ann Dermatol Venereol 2007;134:667-71. 78. Song J, Volkov S, Shea CR, Alegre ML, Salgia R, Gregg K, et al. Nephrogenic systemic fibrosis associated with stromal and vascular calcification, report of two cases. J Cutan Pathol 2009;36:31-4. 79. Hope TA, Herfkens RJ, Denianke KS, LeBoit PE, Hung YY, Weil E. Nephrogenic systemic fibrosis in patients with chronic kidney disease who received gadopentetate dimeglumine. Invest Radiol 2009;44:135-9. 80. Deng A, Martin DB, Spillane A, Chwalek J, St Surin-Lord S, Brooks S, et al. Nephrogenic systemic fibrosis with a spectrum of clinical and histopathological presentation: A disorder of aberrant dermal remodeling. J Cutan Pathol 2010;37:204-10. 81. Bridges MD, St Amant BS, McNeil RB, Cernigliaro JG, Dwyer JP, Fitzpatrick PM. High-dose gadodiamide for catheter angiography and CT in patients with varying degrees of renal insufficiency: Prevalence of subsequent nephrogenic systemic fibrosis and decline in renal function. AJR Am J Roentgenol 2009;192:1538-43. 82. Martin DR, Semelka RC, Chapman A, Peters H, Finn PJ, Kalb B, et al. Nephrogenic systemic fibrosis versus contrast-induced nephropathy: Risks and benefits of contrast-enhanced MR and CT in renally impaired patients. J Magn Reson Imaging 2009;30:1350-6. 83. Swaminathan S, Arbiser JL, Hiatt KM, High W, Abul-Ezz S, Horn TD, et al. Rapid improvement of nephrogenic systemic fibrosis with rapamycin therapy: Possible role of phospho-70-ribosomal-S6 kinase. J Am Acad Dermatol 2010;62:343-5. 84. Koreishi AF, Nazarian RM, Saenz AJ, Klepeis VE, McDonald AG, Farris AB, et al. Nephrogenic systemic fibrosis: A pathologic study of autopsy cases. Arch Pathol Lab Med 2009;133:1943-8. 85. Boyd AS, Sanyal S, Abraham JL. Tissue gadolinium deposition and fibrosis mimicking nephrogenic systemic fibrosis (NSF)-subclinical nephrogenic systemic fibrosis? J Am Acad Dermatol 2009;62:337-42. 86. Foss C, Smith JK, Ortiz L, Hanevold C, Davis L. Gadolinium-associated nephrogenic systemic fibrosis in a 9-year-old boy. Pediatr Dermatol 2009;26:579-82. 87. Wollanka H, Weidenmaier W, Giersig C. NSF after Gadovist exposure: A case report and hypothesis of NSF development. Nephrol Dial Transplant 2009;24:3882-4. 88. Hoppe H, Spagnuolo S, Froehlich JM, Nievergelt H, Dinkel HP, Gretener S, et al. Retrospective analysis of patients for development of nephrogenic systemic fibrosis following conventional angiography using gadolinium-based contrast agents. Eur Radiol 2010;20:595-603. 89. Wiedemeyer K, Kutzner H, Abraham JL, Thakral C, Carlson JA, Tran TA, et al. The evolution of osseous metaplasia in localized cutaneous nephrogenic systemic fibrosis: A case report. Am J Dermatopathol 2009;31:674-81. 90. Wilford C, Fine JD, Boyd AS, Sanyal S, Abraham JL, Kantrow SM. Nephrogenic systemic fibrosis: Report of an additional case with granulomatous inflammation. Am J Dermatopathol 2010;32:71-5. 91. Schieren G, Wirtz N, Altmeyer P, Rump LC, Weiner SM, Kreuter A. Nephrogenic systemic fibrosis--a rapidly progressive disabling disease with limited therapeutic options. J Am Acad Dermatol 2009;61:868-74. 92. Elmholdt TR, Bettina J, Mette R, Pedersen M, Olesen AB. Two cases of nephrogenic systemic fibrosis after exposure to the macrocyclic compound gadobutrol. NDT Plus 2010;3:1-3. 93. Sanchez-Ross M, Snyder R, Colome-Grimmer MI, Blumberg M, Huttenbach Y, Raimer S. Nephrogenic fibrosing dermopathy in a patient with systemic lupus erythematosus and acute lupus nephritis. Pediatr Dermatol 2007;24:E36-9. 94. Schietinger BJ, Brammer GM, Wang H, Christopher JM, Kwon KW, Mangrum AJ, et al. Patterns of late gadolinium enhancement in chronic hemodialysis patients. JACC Cardiovasc Imaging 2008;1:450-6. 95. Heinz-Peer G, Neruda A, Watschinger B, Vychytil A, Geusau A, Haumer M, et al. Prevalence of NSF following intravenous gadolinium-contrast media administration in dialysis patients with endstage renal disease. Eur J Radiol 2010;76:129-34. 96. Tsushima Y, Takahashi-Taketomi A, Endo K. Nephrogenic systemic fibrosis in Japan: Advisability of keeping the administered dose as low as possible. Radiology 2008;247:915-6. 97. Rodríguez Jornet A, Andreu Navarro FJ, Orellana Fernández R, Ibeas López J, Fortuño Andrés JR. [Gadolinium-induced systemic fibrosis in advanced kidney failure]. Nefrologia 2009;29:358-63. 98. Bhawan J, Swick BL, Koff AB, Stone MS. Sclerotic bodies in nephrogenic systemic fibrosis: A new histopathologic finding. J Cutan Pathol 2009;36:548-52. 99. Al Habeeb A, Partington S, Rosenthal D, Salama S. Skin thickening in a hemodialysis patient: A case of nephrogenic fibrosing dermopathy. J Cutan Med Surg 2009;13:110-4. 100. Nakai K, Takeda K, Kimura H, Miura S, Maeda A. Nephrogenic systemic fibrosis in a patient on long-term hemodialysis. Clin Nephrol 2009;71:217-20. 101. Su HS, Nazarian RM, Scott JA. Case report. Case report. Appearance of nephrogenic fibrosing dermopathy on a bone scan. Br J Radiol 2009;82:e35-6. 102. Lu CF, Hsiao CH, Tjiu JW. Nephrogenic systemic fibrosis developed after recovery from acute renal failure: Gadolinium as a possible aetiological factor. J Eur Acad Dermatol Venereol 2009;23:339-40. 103. Kroshinsky D, Kay J, Nazarian RM. Case records of the Massachusetts General Hospital. Case 37-2009. A 46-year-old woman with chronic renal failure, leg swelling, and skin changes. N Engl J Med 2009;361:2166-76. 104. Edgar E, Woltjer R, Whitham R, Gultekin SH, Watnick S, Cupler EJ. Nephrogenic systemic fibrosis presenting as myopathy: A case report with histopathologic correlation. Neuromuscul Disord 2010;20:411-3. 105. Shabana WM, Cohan RH, Ellis JH, Hussain HK, Francis IR, Su LD, et al. Nephrogenic systemic fibrosis: A report of 29 cases. AJR Am J Roentgenol 2008;190:736-41. 106. Altun E, Martin DR, Wertman R, Lugo-Somolinos A, Fuller ER 3rd, Semelka RC. Nephrogenic systemic fibrosis: Change in incidence following a switch in gadolinium agents and adoption of a gadolinium policy--report from two U.S. universities. Radiology 2009;253:689-96. 107. Zou Z, Ma L, Li H. Incidence of nephrogenic systemic fibrosis at Chinese PLA General Hospital. J Magn Reson Imaging 2009;30:1309-12. 108. Rydahl C, Thomsen HS, Marckmann P. High prevalence of nephrogenic systemic fibrosis in chronic renal failure patients exposed to gadodiamide, a gadolinium-containing magnetic resonance contrast agent. Invest Radiol 2008;43:141-4. 109. Okada S, Katagiri K, Kumazaki T, Yokoyama H. Safety of gadolinium contrast agent in hemodialysis patients. Acta Radiol 2001;42:339-41. 110. Joffe P, Thomsen HS, Meusel M. Pharmacokinetics of gadodiamide injection in patients with severe renal insufficiency and patients undergoing hemodialysis or continuous ambulatory peritoneal dialysis. Acad Radiol 1998;5:491-502. 111. Broome DR, Girguis MS, Baron PW, Cottrell AC, Kjellin I, Kirk GA. Gadodiamide-associated nephrogenic systemic fibrosis: Why radiologists should be concerned. AJR Am J Roentgenol 2007;188:586-92. 112. Mazhar SM, Shiehmorteza M, Kohl CA, Middleton MS, Sirlin CB. Nephrogenic systemic fibrosis in liver disease: A systematic review. J Magn Reson Imaging 2009;30:1313-22. 113. Lohan DG, Tomasian A, Saleh RS, Singhal A, Krishnam MS, Finn JP. Ultra-low-dose, time-resolved contrast-enhanced magnetic resonance angiography of the carotid arteries at 3.0 tesla. Invest Radiol 2009;44:207-17. 114. Grobner T, Prischl FC. Patient characteristics and risk factors for nephrogenic systemic fibrosis following gadolinium exposure. Semin Dial 2008;21:135-9. 115. Murphy KP, Szopinski KT, Cohan RH, Mermillod B, Ellis JH. Occurrence of adverse reactions to gadolinium-based contrast material and management of patients at increased risk: A survey of the American Society of Neuroradiology Fellowship Directors. Acad Radiol 1999;6:656-64. 116. Singer BD, Woodrick RS, Pedicano JB. Severe adverse drug reaction to gadobenate dimeglumine. ScientificWorldJournal 2009;9:363-5. 117. Katayama H, Yamaguchi K, Kozuka T, Takashima T, Seez P, Matsuura K. Adverse reactions to ionic and nonionic contrast media. A report from the Japanese Committee on the Safety of Contrast Media. Radiology 1990;175:621-8. 118. Provenzale JM. Nephrogenic systemic fibrosis: Some considerations on the debate regarding its cause. AJR Am J Roentgenol 2008;191:1867-9. 119. Marckmann P. An epidemic outbreak of nephrogenic systemic fibrosis in a Danish hospital. Eur J Radiol 2008;66:187-90. 120. Garcia-Tsao G, Boyer JL. Outpatient liver biopsy: How safe is it? Ann Intern Med 1993;118:150-3. 121. Strassburg CP, Manns MP. Approaches to liver biopsy techniques--revisited. Semin Liver Dis 2006;26:318-27. 122. Silva MA, Hegab B, Hyde C, Guo B, Buckels JA, Mirza DF. Needle track seeding following biopsy of liver lesions in the diagnosis of hepatocellular cancer: A systematic review and meta-analysis. Gut 2008;57:1592-6. 123. Panda S, Bandyopadhyay D, Tarafder A. Nephrogenic fibrosing dermopathy: A series in a non-Western population. J Am Acad Dermatol 2006;54:155-9. 124. Reilly RF. Risk for nephrogenic systemic fibrosis with gadoteridol (ProHance) in patients who are on long-term hemodialysis. Clin J Am Soc Nephrol 2008;3:747-51. 125. Marckmann P, Skov L, Rossen K, Heaf JG, Thomsen HS. Case-control study of gadodiamide-related nephrogenic systemic fibrosis. Nephrol Dial Transplant 2007;22:3174-8. 126. Wertman R, Altun E, Martin DR, Mitchell DG, Leyendecker JR, O'Malley RB, et al. Risk of nephrogenic systemic fibrosis: Evaluation of gadolinium chelate contrast agents at four American universities. Radiology 2008;248:799-806.